The number one way of working on difficult to access structures and locations is rope access. It is the best system for completing work safely and quickly. Often without disruption to other work being carried out nearby. However, performing work on some structures and locations is difficult. Especially when the rope access technician tries to maintain stability. Wind turbines, ships hulls and offshore structures all provide unique challenges. This becomes clear when performing certain tasks. Blasting and spraying for instance. The usual method is to “tie-in” to provide the necessary support. But, in a lot of cases, this is difficult and impractical. Newton’s third law of motion states that for every action there is an equal and opposite reaction. During rope access activities this becomes clear. When a rope access technician is attempting to perform work on a substrate. Work such as blasting, spraying, grinding, drilling, welding, and most other mechanical actions. The force being applied by the activity pushes the technician away from the substrate. This causes a problem for the technician involved. Making it difficult to maintain stability. 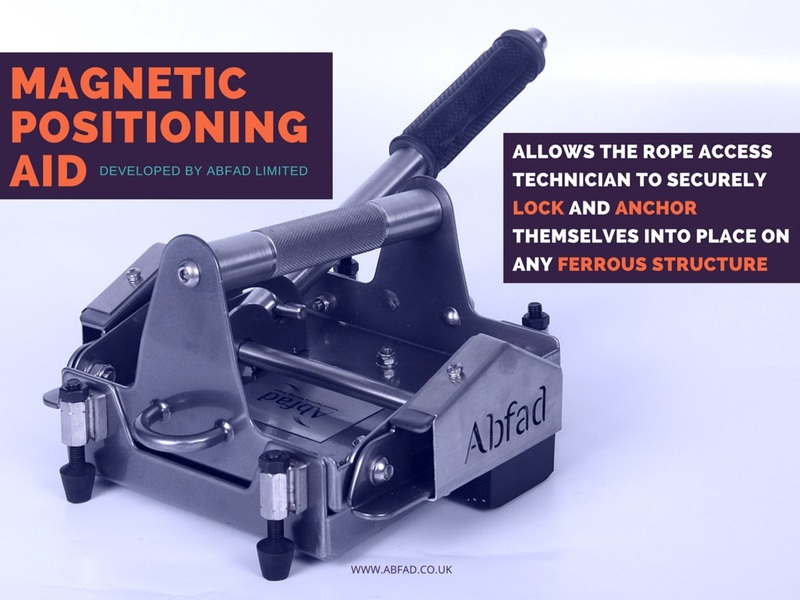 Abfad Limited have developed a Magnetic Positioning Aid for use with rope access. This Magnet System allows the rope access technician to securely lock and anchor into place on any ferrous structure. Thus counteracting the forces which would push them away. Giving the technician the stability needed to carry out any required work. And, carry it out with confidence and precision. Developed and improved upon since its conception. Our Magnet System in its current form is the best yet. The system has been rigorously tested during its development. Including by the TWI (The Welding Institute). The TWI tested the pull off strength of the magnets, which currently stands at over 355kgs. Use of this Magnet System provides a clear advantage to productivity. Increasing the speed of work by stabilising the technician on any ferrous structure. Allowing them to carry out any activity with greater precision and accuracy.